Green, growing things just liven up the atmosphere in a home. Indoor plants, however, dry out very easily. 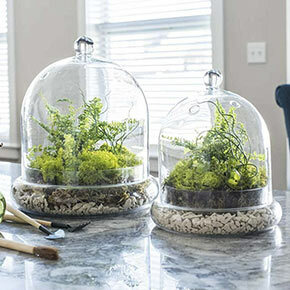 With this glass terrarium's stylish design, it shows off your carefully cultivated plants and makes it easier to keep them healthy. The holes on the top keep it breathable, so it can hold in the humidity your houseplants crave without steaming up. 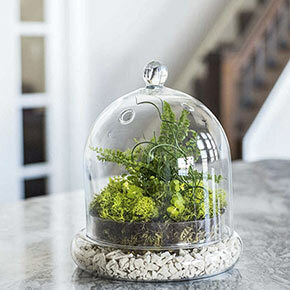 This Cloche Terrarium makes a beautiful 360° display that'll keep mess and soil neatly inside and curious pets out. 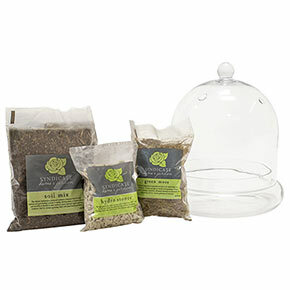 Terrariums are popular right now, but we selected this particular kit because it includes everything you need; a glass cloche, a bag of stones, green moss and a soil mix. Just put in your houseplants and you're ready to go. Since it's all in one complete set, it makes a great gift—it's especially sweet as a housewarming present. Small Kit is 7"W x 8 1/4"H, Large Kit is 10"W x 11 3/8"H.